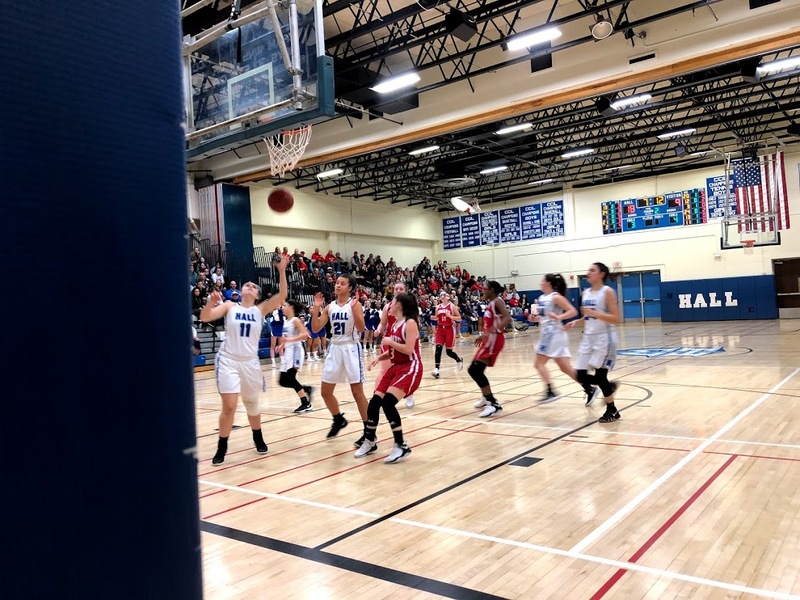 Conard climbed back from a 23-point deficit to defeat Hall and clinch a state tournament berth. 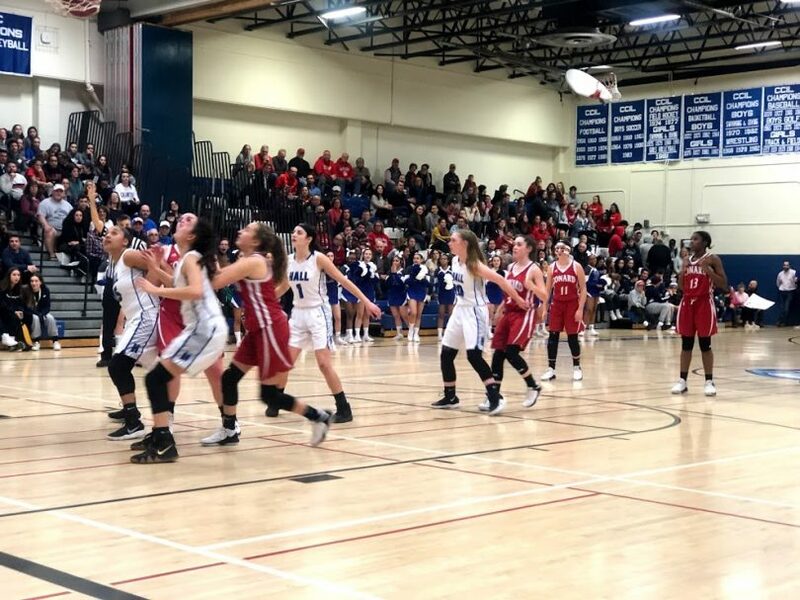 Lacking the experience and firepower the Warriors have at their disposal, it would have been easy for a young, undersized Conard team to let a double-digit margin spell disaster on the road against its archrival. 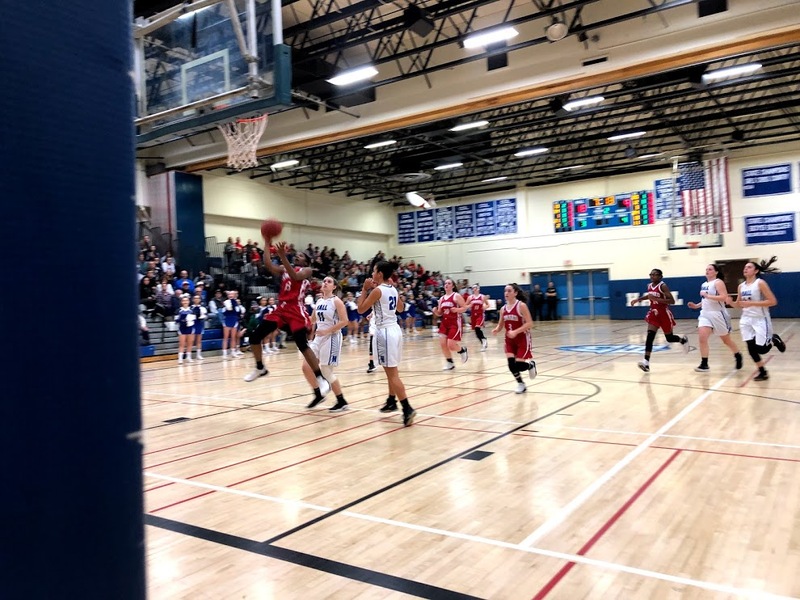 Instead, behind a combined 43 points from Meghann Morhardt and Azaiyah Felder, the Chieftains (8-4) erased a 23-point second-half deficit to grab a 56-53 win at Hall (7-6) Friday night in West Hartford. Morhardt scored a game-high 25 points, including 20 in the second half, to spark the comeback. 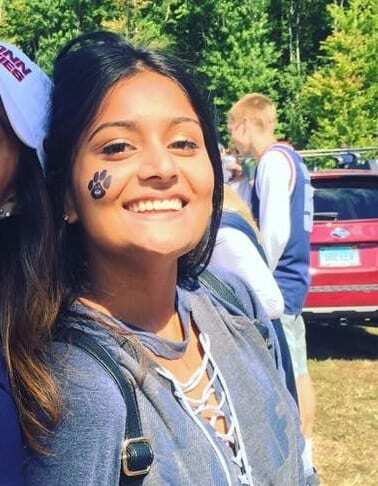 The senior captain made six of her seven 3-pointers in the second half, many of them uncontested as teammates found her open on several occasions. Felder chipped in 18 points – 16 in the second half – by not shying away from contact and getting to the basket, a method that was not as effective in the first two quarters. 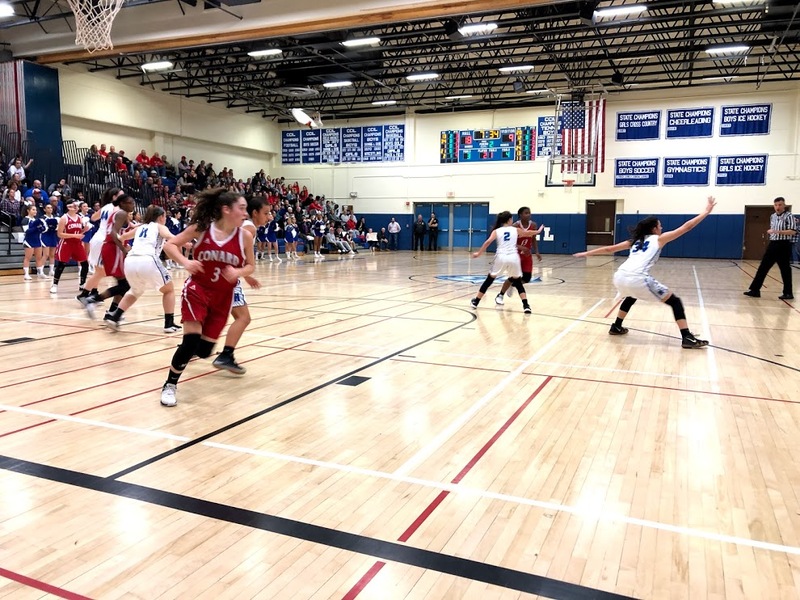 Down 31-12 at halftime, there was not much working well for Conard as a team. 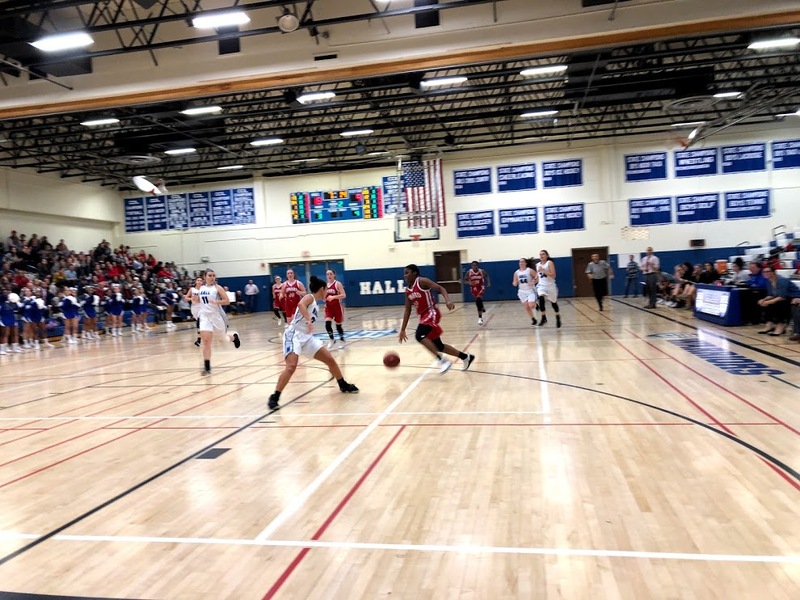 Hall dominated on both sides of the floor with fluid ball movement and rock-solid defense, especially as the Chieftains tried to attack the paint. The Warriors led 17-9 after one quarter. Hall outscored Conard 14-3 in the second to extend its lead. The Warriors scored twice in the first 90 seconds of the third quarter to swell the lead to 35-12 before the Chieftains came storming back. “Going into halftime, it wasn’t a good feeling,” said D’Angelo. “A lot of our shots weren’t falling, Azaiyah seemed to be pressing, and we seemed to be pressing because we were counting her, so we weren’t doing the things we normally do. Morhardt made her first 3-pointer of the half with just over six minutes left in the third quarter. After an Ella DiPippo layup, Morhardt followed with another long ball, cutting the margin to 15. 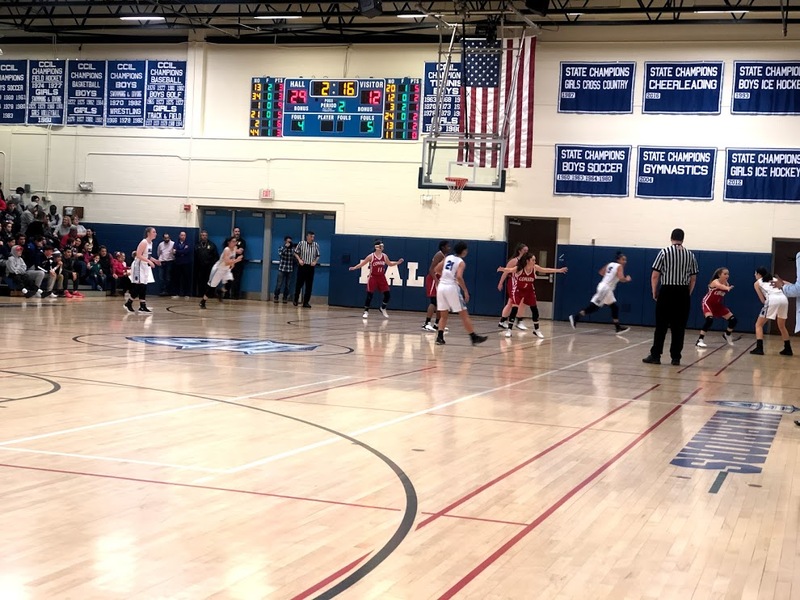 Conard turned that stretch into a 24-6 run, capped by Morhardt’s fourth 3-pointer of the quarter with two seconds on the clock. 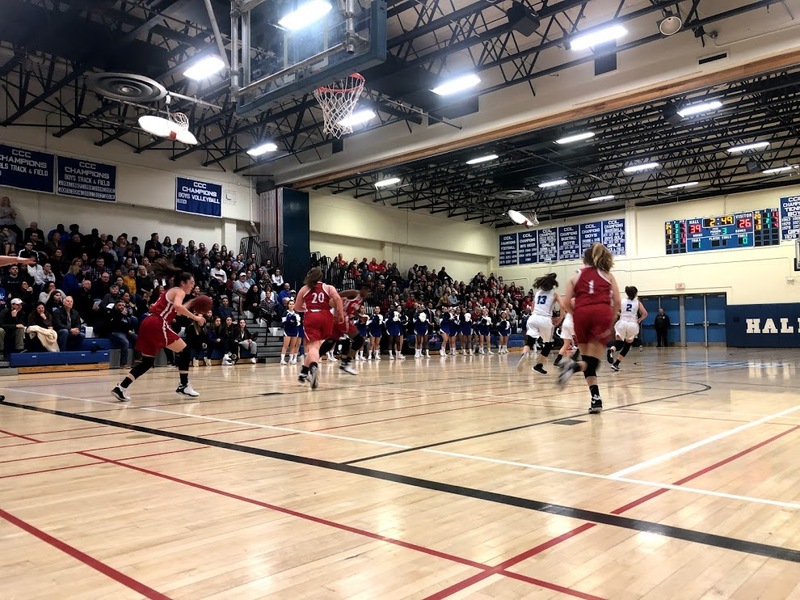 A seemingly insurmountable lead nearly evaporated over the span of six minutes, as the Chieftains trailed 41-36 entering the fourth. 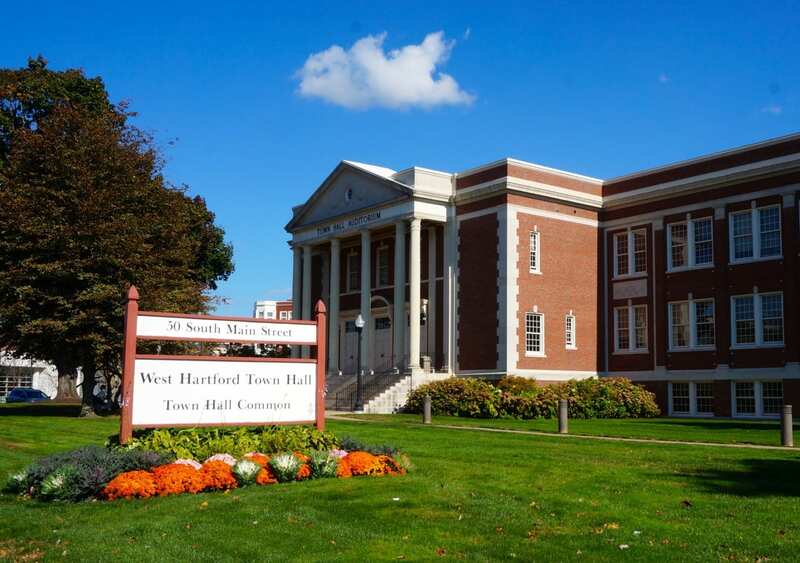 But Hall went on a 6-0 run to go up by 11 in the first minute of the quarter to keep Conard at bay. Jordan Farrell made a layup and completed the 3-point play after being fouled with 7:28 to play. Colleen Kennedy made her second 3-point shot of the night at the 7-minute mark to give the Warriors a 47-36 advantage. Morhardt responded 10 seconds later with another long ball to keep Conard in the game. Felder later added a pair of free throws and a fast break layup to cut the deficit to 47-43 halfway through the fourth quarter. 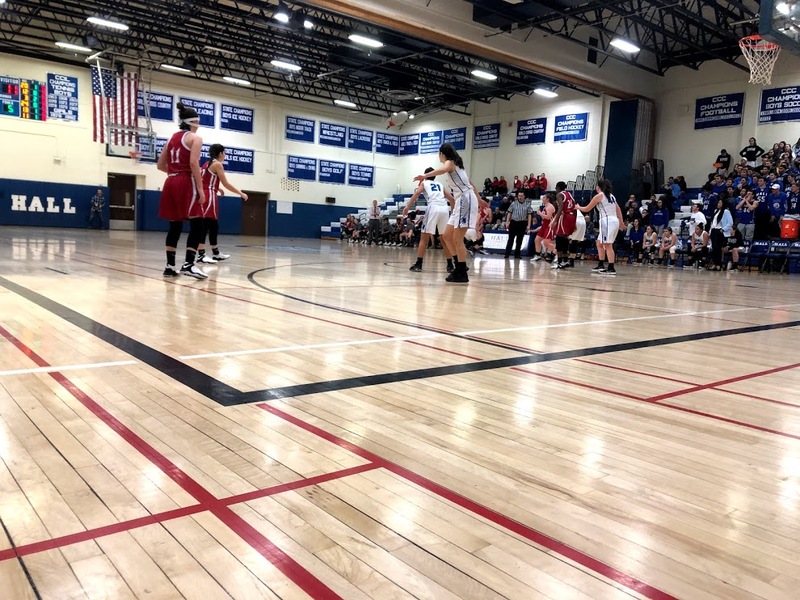 Coming out of a timeout down 49-47, Felder scored again to tie the game and sunk the ensuing free throw to give Conard a 50-49 lead – its first of the game – with 2:13 to play. Jenna Zydanowicz tied the game at 51 with 1:42 remaining, but Morhardt drilled a deep ball to put the Chieftains ahead 54-51. Siobhan Boyle scored with 45 seconds left to bring Hall within one but failed to convert the ensuing free throw to tie the game. 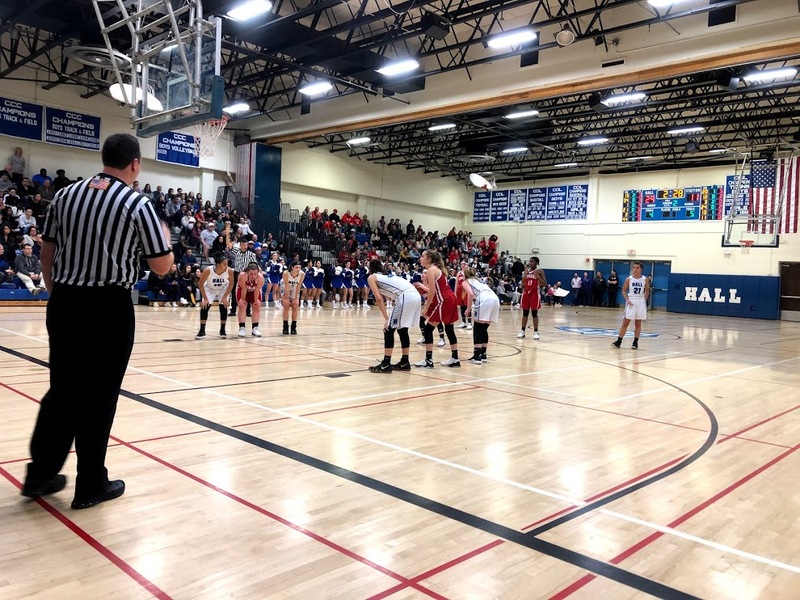 Morhardt scored her last two points from the free throw line with 16.8 seconds remaining to seal the victory for the Chieftains. Olivia Deslauriers and Zydanowicz led Hall 11 points each, while Farrell added 10. 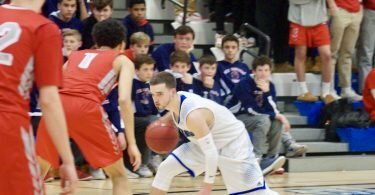 D’Angelo lauded Morhardt’s efforts to lead the Chieftains in a pivotal matchup of teams likely to make the state tournament. Despite both teams entering with seven wins, D’Angelo knew his bunch would not have it easy on the Warriors’ home court. 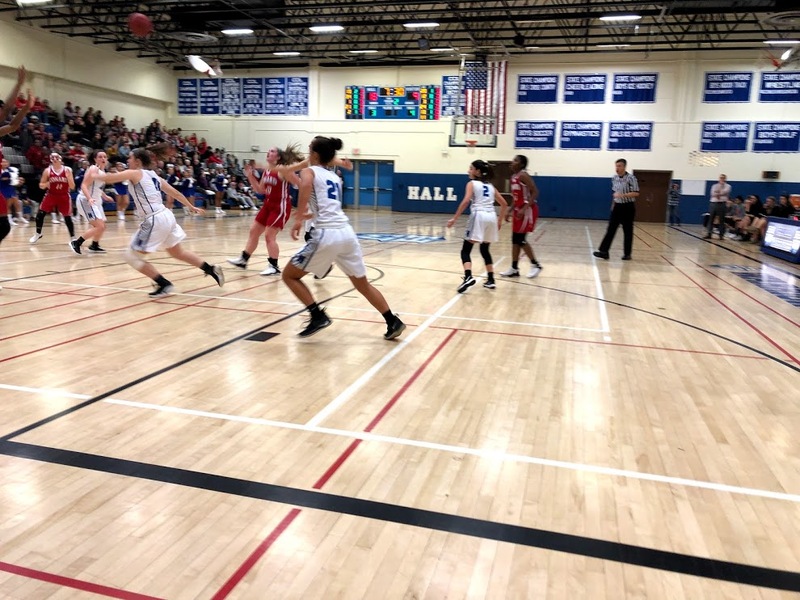 Riding a four-game winning streak, the victory against Hall has extra significance for Conard – aside from the crosstown rivalry – as it earned the team a postseason berth. Conard will host Middletown (7-5), while Hall will take on Platt (3-9) at home on Tuesday night at 6:45 p.m.